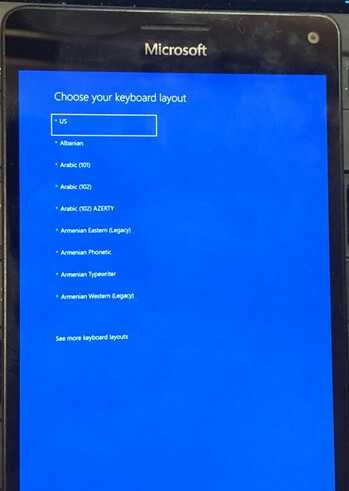 For hacker Ben | imbushuo to be able to install Windows 10 for ARM on a Microsoft Lumia 950 XL, he had to develop a custom Unified Extensible Firmware Interface (UEFI) bootloader for the phone. After all, Windows 10 requires a secure boot environment. The hacker did the work on the custom UEFI last month, and today he tweeted images of a Lumia 950 XL running the ARM version of the operating system. In case you've forgotten, the Lumia 950 XL was launched in November 2015, and is powered by a Snapdragon 810 chipset containing four Cortex-A57 and four Cortex-A53 cores. The phone was released with Windows 10 Mobile out of the box. While impressive, the Lumia 950 XL has a long way to go before it can match the HTC HD2, which originally was powered by Windows Mobile Professional 6.5. Released in 2009, the HTC HD2 has been loaded with various versions of Android including Nougat. Once again, I'm amazed by the work and creativity of people. This is very cool! Awesome hope windows 10 on arm become a choice in the android and ios land of smartphone industry sooner or later really bored of both the os currently present in the smartphone market nothing anymore unique and special.Fluent design language and live tiles will be something i want in a smartphone with a stylus. I agree that smartphone OS has been stagnant for a long time, but I think windows phone is not the answer if you are trying to use something new. Look at the Windows on PC, UWP framework was designed without vision, no attention to detail, no design language, it takes a minute to launch UWP app. I use Lenovo Y50 with latest April release of Windows 10, and it is boring. App window would blink if you maximize it, The minimize animation is still broken since the first release of Windows 10. If you resize a window, there's a blue background on the side of the window. It is just disappointing experience. It would be great to have the option to dual boot Android or Win 10. Versatility at its best. Windows is a powerful OS, not like that crappy closes ios! Still butthurt about the Apple Earnings? I wonder if this will inspire Cotulla, aka the Supreme Master of Windows development. Nice work. I too can one day see a handset being both my desktop and on the go phone.